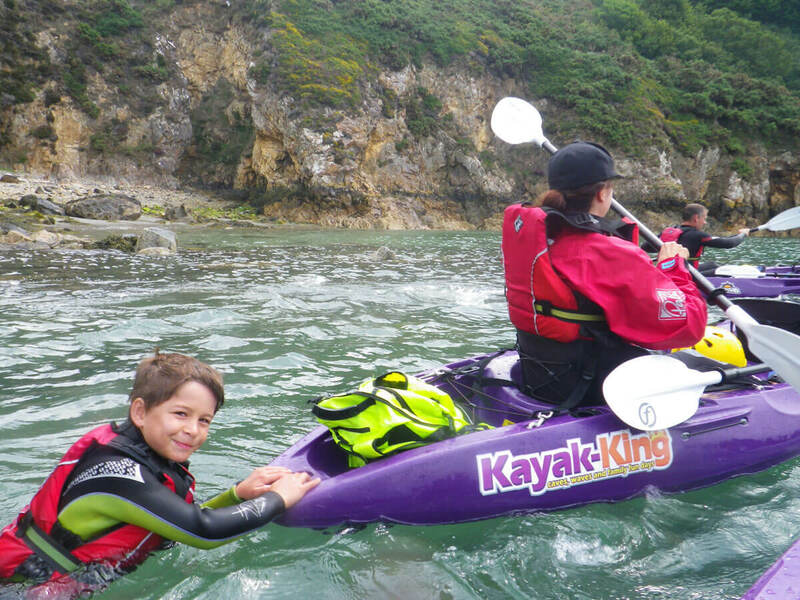 Frequently asked questions - Kayak-King tours Pembrokeshire, Wales. How long do kayaking tours last for? Tours last between 2 & 2.5 hours. Does booking morning or afternoon make a difference? Morning or afternoon doesn’t make a difference. The weather and marine life can be spotted at any time and tide. Four years+ and we have no upper age limit as long as you have a basic level of fitness and are water confident. We can provide equipment for children from one metre in height. We ask younger children and less strong individuals to go in a double with a family member or (if required) one of our guides. This way they can enjoy the ride without having to worry about paddling themselves along. Kayak with comfy seat and paddle. Wetsuit, Windproof/Waterproof Jacket and other equipment. You are welcome to wear your glasses on a kayaking tour with us. If you would like to wear glasses then it is at your own risk but we do have some glasses leashes available for you to borrow. We are in Fishguard which is accessible from most of Pembrokeshire. Please book before arriving, we are a mobile business and will only be on location at Lower Town Fishguard harbour on days when tours are running. Once you arrive in the harbour look for the Kayak-King van in the main car park. We do not provide changing rooms. Our customers get changed around their cars or near our van. We advise a big towel to pop around you while changing. You are welcome to leave your clothes in our van if you aren’t bringing a vehicle with you. Do you have single or double kayaks? We have both single and double kayaks available for use. Please let us know your preference when booking. Be aware our guides may ask you to change into a double/tandem or single kayak at the start of your tour to guarantee your enjoyment. We start in a sheltered harbour allowing you to learn in a controlled environment and, with the high coastal cliffs, we can often access all the sites of interest while staying in the reasonable shelter. On the rare occasion that we have to cancel our tours (due to high winds), we offer a different tour date or a refund depending on your requirements. Not being able to swim is okay with us as long as you are water confident, our sit on top kayaks are very stable meaning that, unless you want to, it’s extremely unlikely you will be in the water and if for some reason you do get wet you will be wearing a buoyancy aid which keeps you afloat. Our qualified kayaking guides will assist in any way needed and will be on hand throughout your tour. If you are a really nervous non-swimmer please talk to us before booking! We can give you specialist “one on one” help and encouragement but a certain level of confidence is required to keep you safe in the sea. We love our furry friends but sadly we cannot take them kayaking with us… This is why we have teamed up with the excellent “Dogsbody Pet Hotel” who provide daycare. Call – 01348 873737 or get in contact with them through Facebook. Can I use my own activity equipment? Yes, of course! We will have a quick chat about your kit and check it is suitable for the environment and that it is in good condition. We can also help you with any questions you may have on your equipment. Kayak-King has a range of equipment for sale. Please visit our online shop or get in contact for details. We hold Public Liability insurance up to £5 million and are happy to provide a copy of our certificate should you need one. Bookings with Kayak King DO NOT include personal travel or accident insurance. Please ask your insurer for details of the necessary cover for taking part in kayaking. Is the Pembrokeshire coastal path as good from sea level? We think it’s much better. Kayaking is an amazing way of viewing the park in a whole new light; being close to the cliffs and seeing their jagged majestic faces looming above you, journeying into their very heart in the amazing sea caves. You will have walked over the caves without ever realising the inner sanctums that lie beneath your feet, their strange and sometimes eerie sights and smells can really make you feel like you are journeying into a new world. Seeing a seal at close range and occasionally so close that you can meet it eye to eye, feeling some of the innate intelligence that other mammals have is a memorable experience. Cormorants diving, shags relaxing and sunning themselves on rocks are all a few of the delights that will appear right in front of your eyes! At certain times of the year, Kayak-King has crab and lobster pots that can be pulled up so you can see different crustacea in their natural form and, if you’re brave enough, handle them! All of our instructors are well versed in local wildlife and enjoy answering any questions that may be asked. We hope our frequently asked questions have helped you. Got a different question? Please add it to the message section during your booking enquiry by clicking here.